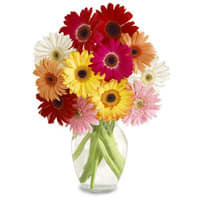 Gift this Delicate Fresh Mixed 15 Gerberas Arrangement with Vase to keep your beloved smiling and happy. It is perfect for your loved ones. 16 pcs Vibrant Gerberas in a Glass Vase and Assorted Cadburys Chocolate. 16 pcs Vibrant Gerberas in a Glass Vase with 500 grms Assorted Sweets. 16 pcs Vibrant Gerberas in a Glass Vase with 16 pcs Ferrero Rocher chocolate box.